Over the past few months I have experienced the most profound feeling of community. In Acts 2:42, we hear that true community is “devoting yourselves to God’s Word, fellowshipping and breaking bread together (that means hanging out with your friends), and to prayer.” Never have I experienced all these components so intensely. When a storm comes into your life (mine is cancer, but yours may be different), community brings us together just as God intended it to be. A lot of people have asked me over the years about our little community of neighbors on Whitewater Drive. Some of you know the story, but let me tell it to you in summarized (sort of) version. … Twelve years ago Greg wanted to buy property so we could build a house and raise our kids in the great town of Poway. He kept looking at land and lots and I kept saying that I didn’t just want a LOT/Property away from everything—that I wanted a true neighborhood. So, with the amazing provision of God--Greg, Jeff, and Kraig found this property in the hills of Poway. It was already approved by the city to have NINE single home lots—each being over an acre. So, we contacted a number of lifelong friends (mostly through Young Life) and within a month we had nine lots filled and nine families we loved throwing their money into moving into this land. We had lots of blocks to our timeline, and we had to build our own infrastructure—sewage, power, extending the street, etc. but after two years at least three of us were able to lay our foundations for our homes. Once that started, everything went pretty quickly, at least for us—within five months we had our home built and ready for move in (and that same week the Cedar Fire hit our neighborhood, but our house was spared—and that is a whole other story). Within the year, most of the homes were built and our little community began. Over the years we have watched our kids walk to school together to Garden Road Elementary, and now some of our kids are in middle school and high school. We have had July 4 pool parties, Easter egg hunts, pumpkin carving nights, New Year’s Eve gatherings, and just random get togethers where we all barbeque on the Richardson and Weese driveways. We have all been through storms and trials and we have gathered to pray during those times. We are family, we are community. I couldn’t be more blessed with this groups of friends who I truly call “family”. I also have my church community--truly, the friends I have from church are my dearest friends and they display the hands and feet of Jesus daily. They have surrounded me with love, meals, chemo partners, gifts, flowers, cards, and so much prayer and encouragement. They live out Acts 2:42 in their whole lives. I have had so much fun and laughter over the years with my church community. I have my extended community in Poway of the amazing soccer and lacrosse families, the neighbors in the surrounding area, and the awesome teachers at the schools. I also have my teacher friends (from back in the day) who love and support me, I have my friends from childhood and high school who reach out to me on FB and through calls and cards. I have my incredible lifelong college friends who I have never laughed and shared so much with—and we continue to have reunions, and I can talk to them just like we were still Resident Advisors in the college dorms. I have my true birth family, crazy as we all are—my mom, dad, and little sis Karen—who from afar send me love, encouragement and prayers. I am absolutely surrounded by community. Are you? Who supports you, prays for you, encourages you, loves you even with your flaws? We all need this. It is what God wants for us. But I also have another community—where my heart is—in the country of Uganda and the villagers in the town of Guru Guru. I have been with them for two years and couldn’t go this year because of cancer. Noah went, and had an incredible time with our team and with his village friends. Guru Guru is truly our “second home.” Since my Ugandan friends found out about my cancer, they have been fervently praying for my healing, and believe me—their prayer and worship is like nothing in America. It is utterly abandoned and true and real. And they have faith beyond compare, even though they have been ravaged by war and displacement camps for two generations. The women and teens there—my heart is so with them. 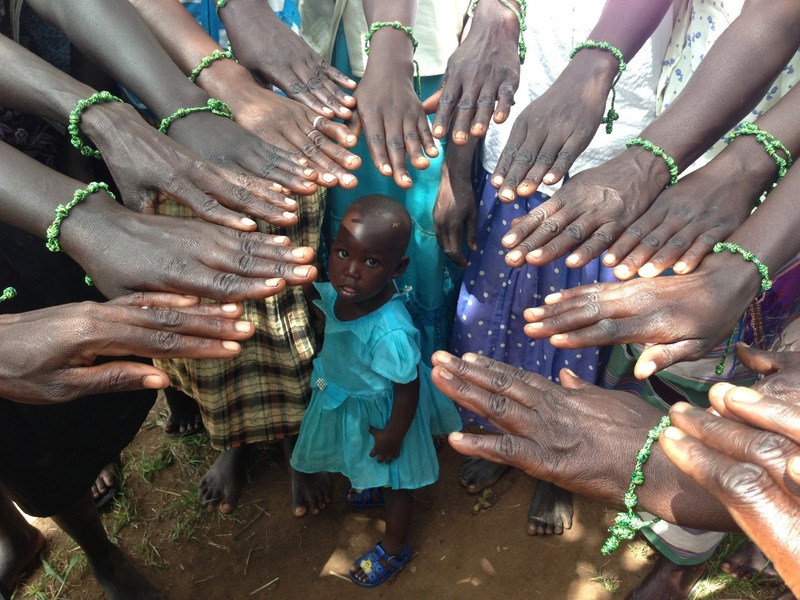 While our team was in Uganda this year, the team of women gathered together and made the green bracelets that many of us are wearing here to support my cancer battle. (if you don’t have one, and want one, let me know and I will send or mail you one). They made the bracelets and prayed for me. I feel so honored to be blessed with my Ugandan friends, many of whom I call “son” or “daughter.” Community and support and family has now crossed continents and the love I feel is beyond what words could say. So I am not going to even address cancer in this post—just tell you all that chemo round 8 starts on Monday, July 29—so please keep praying. I feel your love, support, prayers and encouragement from across the state, the nation, and the continents. I have attached a picture of the women with their green bracelets in Uganda. You all blessed me and I pray blessings upon all of you.